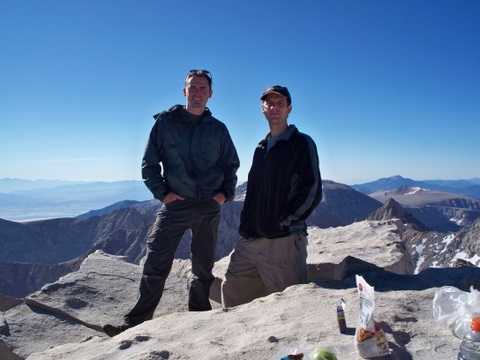 Due to a rather last minute work issue, Mark was unable to hike Mount Whitney with Tom and I. 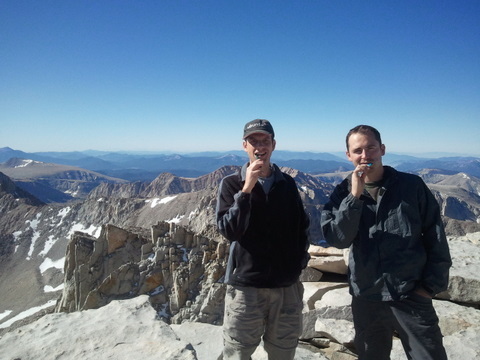 With his blessing, Tom and I decided to still hike Mount Whitney. 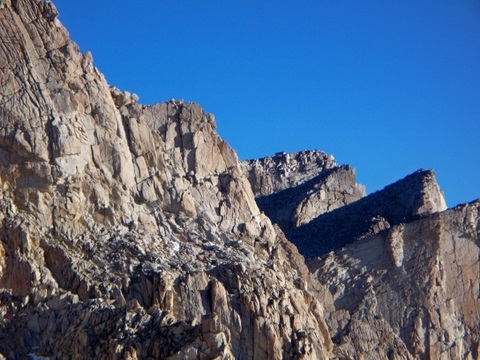 We had decided on Mount Whitney as we had climbed most of the readily accessible mountains in the Intermountain West and the only ones we had left aside from Whitney were all rather technical. As we don’t yet have much training on technical climbing (either over snow or using ropes), we decided we’d give Whitney a try. 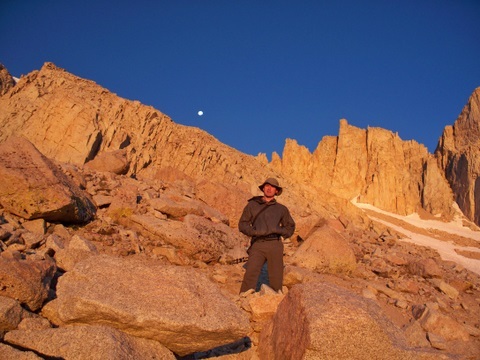 We had tried to get a permit for the last three years to hike Whitney (they use a lottery system to allot permits – 60 day and 60 overnight permits per day), but had not won a permit. However, we decided we’d try anyway hoping there would be at least 3 cancellations on the days we wanted to hike (Mark was still planning on going when we reasoned this out). 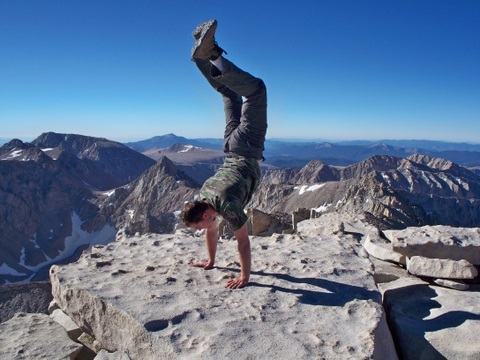 We had been tracking the permits using the Inyo National Forest’s website where they report how many permits were available on given days after the fact and, over the course of the summer, it seemed like there were at least a few every day. So, it seemed like we had good odds. Also, I ended up having a conference I was attending in Las Vegas the week after we had planned to hike, so the timing seemed right. If we didn’t get a permit, we’d just choose a different hike in the area and try again a different time. I called the permit office on the 13th just to make sure we knew where to go when we got there on the 14th to try to get a permit, but the woman I spoke with informed me that we could reserve a permit over the phone. I asked her if there were any available for our target days (8/14-8/17) and she said there were 5 overnight permits available. I jumped at the opportunity (thank you Ann!) and arranged a permit for Tom and me for 2 nights – 8/15-8/17. The trip wasn’t starting all that well, but then our luck began to change. Shortly after the ticket, we drove into Death Valley, which was pretty cool. We stopped and got pictures by the Sea Level sign and saw another sign we decided we would stop by on our way back (see pic below). We also saw one of the coolest things either of us had ever seen. We were driving past Father Crowley Point in Death Valley when a fighter jet flew right over our car (maybe 400 or 500 feet is all), dropped into the valley that Father Crowley Point overlooks, and flew through the valley, banking two times, before flying out into the desert valley below. It was like something straight out of a movie. It was amazing! It happened so fast we didn’t have time to do anything but watch, but we both saw it and were stunned at what we had just seen. I arranged an after hours permit pickup with the permit station, which they probably do regularly as the process was quite painless. 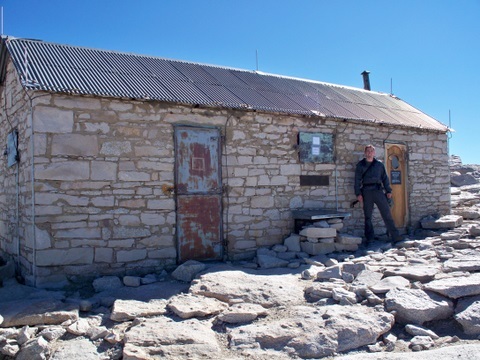 We arrived at the office around 5:15, picked up the permit and headed into Lone Pine to stock up on food for our hike. 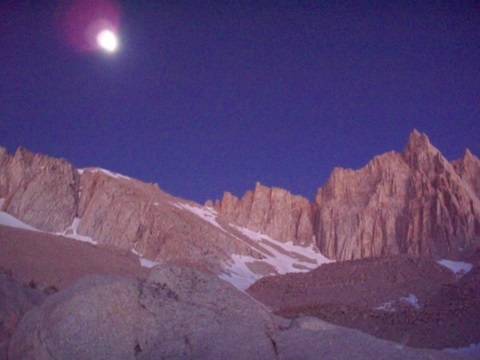 We then grabbed a bite to eat at a Mexican restaurant in town (pretty good food), then headed up to the Mount Whitney campground, hoping to find a campsite for the night. As luck would have it, there was one spot left, which we gladly took. We set up camp by around 7:00. Around 7:45, with night falling and a day of hiking planned for the next day (plus the fact that I had only gotten 4 hours of sleep the night before), we decided to get ready for bed. I walked up to the water pump to brush my teeth and then use the restroom. Just as I came out of the outhouse, Tom ran up and said quietly but urgently, “Bear!” Sure enough, a mid-sized black bear was walking right down the main road in the campground. We watched it walk past us (about 30 feet away), down toward our camp, then back up to the camp above ours where a couple was eating dinner by lamplight and had, unfortunately, left the passenger-side door of their truck open. The bear walked right up to the truck and climbed in like it had done it a million times before. I then asked Tom if he had closed our bear box, which he then realized he had not. He ran down to our camp, which was only about 100 feet from the outhouse and closed the bear box, just in time as the bear, foiled by a cooler that had been tied down in the truck, had climbed out and was lumbering straight for our camp. I followed Tom down and watched as the bear walked around our camp and then headed down the main road toward another camp. Tom tried to snap a photo, but it was too dark for his camera and all he got was a photo of darkness. We went to bed shortly after that. To recap day one, before we even started climbing: we had rental car issues, a ticket, a drive through Death Valley (lowest place in the US), saw a fighter jet fly through a canyon, and an encounter with a black bear in our camp. Not a bad start! 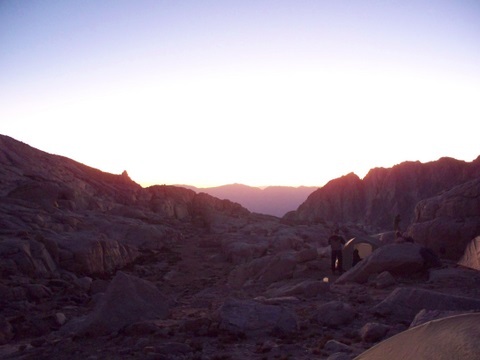 We got up around 6:30, broke camp, readied our packs, then headed up to the trailhead. Since we had not picked up our permit from an actual person at the ranger station, we had also not received any “wag bags,” which are bags that are used to carry human waste. Inside the Whitney zone you are required to store your food in a bear proof canister and you are required to hike your waste back off the mountain. We stopped at the Portal Store to make sure our permit was in order and they gave us a couple of wag bags, then we headed out. We left at around 8:00 am, headed toward Trail Camp, which is 6 miles in and at about 12,000 feet in elevation. The trailhead starts at about 8,000 feet. We made pretty good time, stopping just a couple of times for photos and to adjust backpacks. It took us about 3 1/2 hours to cover the 6 miles and gain 4,000 feet in elevation. 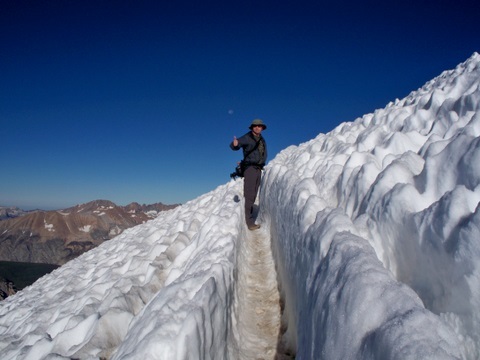 Trail Camp is at about 12,000 feet. We traveled faster than we thought we would and ended up having all afternoon and evening to kill. Tom and I are busybodies who can’t really stand to not be doing something. So, having that much free time was, well, awkward. Luckily I did think to bring up two books I was reading, which kept me occupied for a while, but Tom wasn’t that interested in the books. We also spent a good deal of time just watching as people arrived and left. 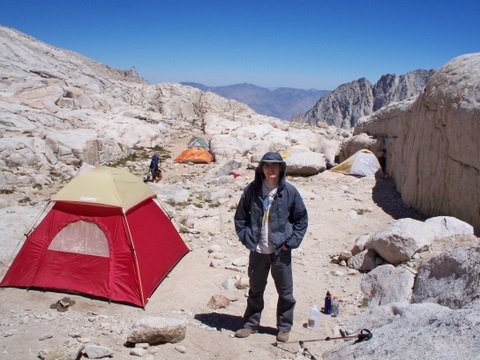 Trail Camp is the main staging area for attempts at the summit and was pretty busy. There were probably 20 tents in the area around us (you can see a few in the photo above). We also tried to eat to get our energy reserves up for our big hike the next day; I rarely have an appetite above 10,000 feet, so eating is a chore. Otherwise, we just kind of sat around. Oh, and while the weather was perfect (not a cloud in the sky), it was kind of chilly, but really warm in our tent, which made it hard to get comfortable. We ate some food, rested, took photos, and then headed out. We left the summit around 9:00 am and headed back to Trail Camp. Along the way, we probably passed 80 people or so. Our early start and quick pace meant we didn’t get stuck behind people, which was nice. 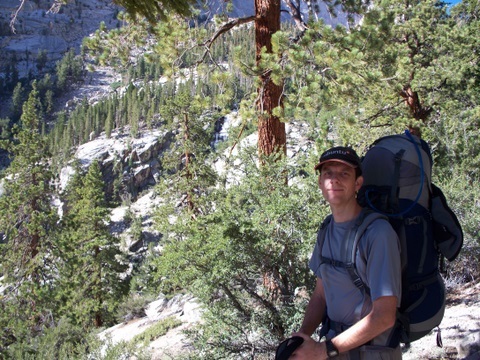 We reached Trail Camp at 11:20, spent 40 minutes packing up and breaking camp, then headed down toward the trailhead. We arrived at the trailhead at 2:20. From the trailhead, we headed down to Lone Pine and ate a very hearty late lunch at Carl’s Jr. (probably over 1,000 calories), then headed back toward Vegas. 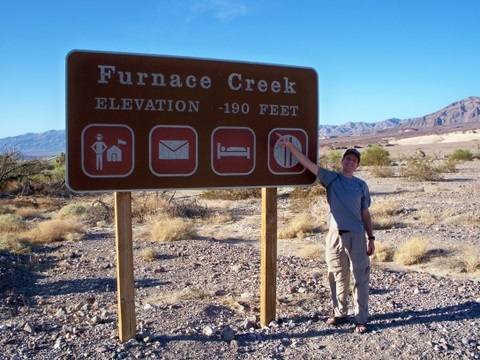 We stopped in a couple of spots in Death Valley, including at this sign indicating the elevation at Furnace Creek of -190 feet below sea level. That was around 5:30 or 6:00 pm. So, we went from the highest point in elevation in the lower 48 states to near the lowest (the lowest is a bit lower than this) in about 9 hours. From there we drove into Vegas. Trip complete.